This experiment has four stimulus lists. Rather than a full randomization, we want to pick a picture at random from one list, another picture at random from another list, and so forth. After a picture has been presented from each list, we go back to choosing a different picture from each list again until all pictures have been used. Four codes are created (the number of codes needs to match the number of stimulus lists). The codes are used as flags to determine which list had an item presented from. In the Event Editor's Feedback tab, we set the code value. For example, if the event presented a picture from list "Monkey", we set code to "Monkey Presented" to "Yes". In the Block Editor, we create four macros, one for each list. 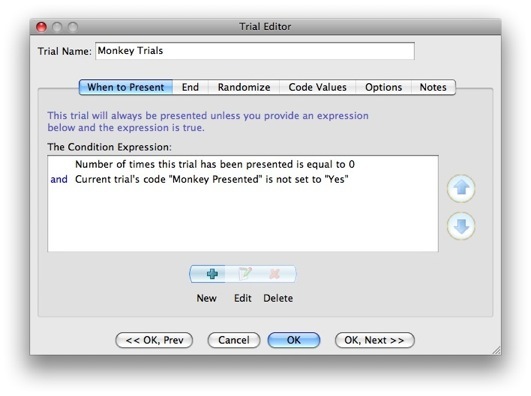 The macro checks to see if the last presented trial was from the "Monkey" list, and if it is, sets the value of code "Monkey Presented" to "Yes" for all the trials. This is needed to avoid picking another item from the same list. We create a macro that runs only after all the trials in the block have been presented. Its sole purpose is to reset the code values for all the trials to "No". We duplicated the block so that we had a total of five, one per each list item. I am programming a task that makes use of the sample experiment, "choosing pix from different lists." Have attached my task here. The added wrinkle is that rather than a single stimulus image, I have two images per trial (differing in emotional valence). I am struggling to get the macros to work right -- rather than running one trial from each list and then moving to the next item in the block, the trials within a block currently select EACH of the items in the stimulus list (n = 3) instead of n = 1. (ultimately, my paradigm should do the following: Present 36 randomly ordered trials, 18 with LeftNegRightPos, and 18 with RightNegLeftPos). This is something that will be faster if discussed over the phone. I will contact you via private message to set up a time. The images are in a folder that are included in the zip. You may have to search the files for them. 1) Superlab is not randomly selecting from my stimulus lists. The stimulus lists are being presented in the order that they were uploaded. How can I fix this? 2) I need participants to respond to the second stimulus set (they see a picture from the first stimulus for a time limit, then they see a picture from the second stimulus list and need to respond to the picture before continuing). I have added response options in the past and they have always worked. However, when I added response options to the event that presents my second stimulus set, superlab will not acknowledge the response during testing. It freezes and will not continue. Is there a way to fix this? It would be helpful if I can see your experiment. Can you post it as an Experiment Package? This is found under the File menu within SuperLab.